Student residences are more than a place to eat and sleep! 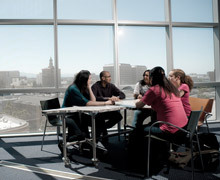 At SJSU, our residence halls and apartments are living and learning communities. Highly trained professional and student staff live within the residential community, providing residents with support and programming. Programs and services are designed to extend students’ learning and personal growth beyond the classroom.